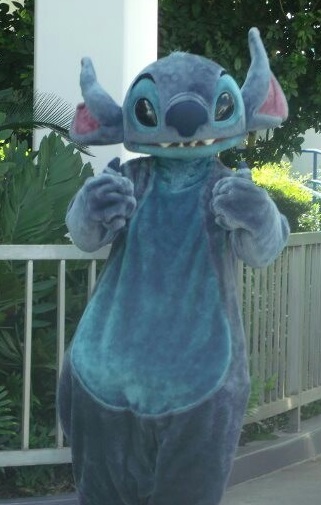 A pre-Lilo "Experiment 626" goes wild on the run in Tomorrowland at Stitch's Great Escape. 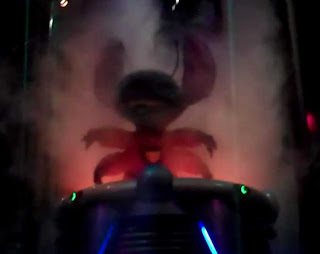 As of November, 2004, our favorite mischievous alien found a new home within the Magic Kingdom, after the shuttering of the ExtraTERRORestrial Alien Encounter attraction. Truth be told, the Stitch-ized version isn't a far reach from its predecessor; we just got a cute, cuddly alien instead of an imposing TERRORizing one. 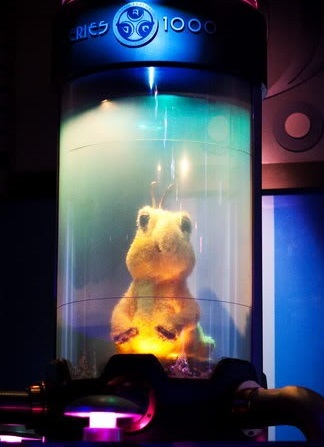 In fact, as a sort of tribute to Alien Encounter, the renovation left behind a straggler - "Skippy" the alien carried over to the new show as well, but in a different role. So, to set the scene... You've been recruited by the Galactic Federation to help secure their dangerous prisoner - Experiment 626/ Stitch. Guests enter a round-style theater with individual seating. Be advised that some guests complain about the seats used at this attraction. For starters, they are not built for comfort, so expect hard molded plastic. BUT... this is really a functional matter, so don't judge too harshly. Seating is a bit claustrophobic for people who have issues in that department. Once the show is set to begin, harnesses lower over your shoulders, and they tend to bounce and push a bit as they figure out where you begin, and adjust for your height. Although this is a show, and you don't actually experience movement, this harness serves a purpose that adds to the experience. If you don't have serious issues, grin and bear it... it's worth it. Once everyone is settled in, your guard duty begins. This "terrifying" prisoner beams into the tube in the center of the theater. When the billowing smoke clears, you see a life-sized Stitch animatronic clawing to escape the captivity tube. And escape he does!! Crashing the power to the theater, Stitch breaks free and goes on a rampage. 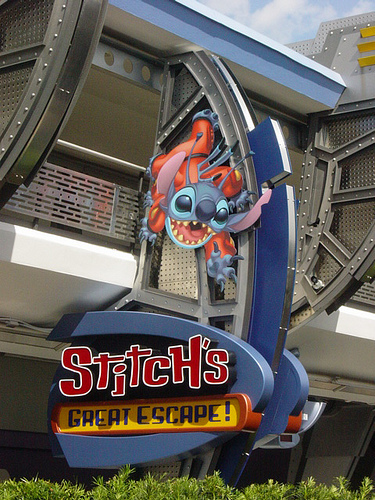 You'll hear, smell and even feel Stitch as he barrels through the room around you on his daring attempt to break free from the Federation altogether. A perfectly orchestrated combination of sensory effects lead to plenty of gasps and chuckles randomly around the darkened theater, until lasers join in to round up the little troublemaker. (By the way... you'll really be wishing Stitch didn't have an appetite for chili dogs!) Just what do you think would happen if Stitch broke loose at WDW? Well, you may find out... if he succeeds!